L.V.J. Winches offers you traditional anchor winches in several types for yachts up to 40 meters. Executed in bronze and stainless steel where necessary. Also available in electric or hydraulic version. 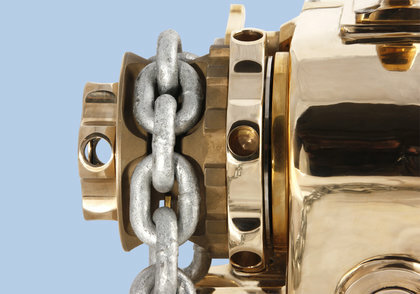 For our anchor winches you need to use always Industrial Short Link Chain DIN-766. 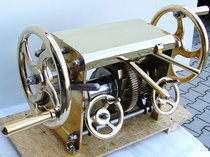 This is a two-speed anchor winch for ships up to about 13 meters. Available for 8 or 10 mm. chain. Bronze wheel with folding grip. Same technical specification as above, but this one has additional a drum for steel wire. Two bronze wheels with folding grip. This is a two-speed anchor winch for ships up to about 20 meters with additional drum for steel wire. Available for 10 or 13 mm chain. Also available in electric or hydraulic version. 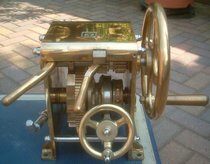 This is an electric capstan anchor winch in 12 or 24 volt. For ships up to about 20 meters. Anchor weight max. 45 kg. For 10 or 13 mm. chain. Also available as Capstan 2500 with a 380 volt electric motor. Anchor weight max. 225 kg. Electric anchorwinch in 12 or 24 volt. Complete bronze design and available for 10 or 13 mm. anchor chain, with a rope drum. Anchor weight max. 50 kg. For the capstan anchor winches we advise you to order at the same time the right chain. Always use a chain stopper (see accessories) to protect your valuable anchor winch.